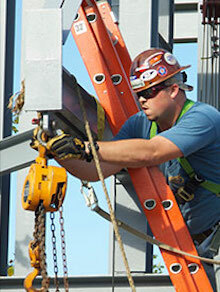 Every year over 300 people die in ladder-related accidents, and thousands suffer disabling injuries. Mark your calendar to join the American Ladder Institute (ALI) in celebrating the first-ever National Ladder Safety Month, designed to raise awareness of ladder safety and to decrease the number of ladder-related injuries and fatalities. National Ladder Safety Month is the only movement dedicated exclusively to the promotion of ladder safety, at home and at work. During March 2017, National Ladder Safety Month will bring heightened awareness to the importance of the safe use of ladders through resources, training and a national dialogue. ALI believes ladder accidents are preventable, but without better safety planning and training and continuous innovation in product design, we will continue to see far too many fatalities. Please join ALI and its members in sharing this message with the world.